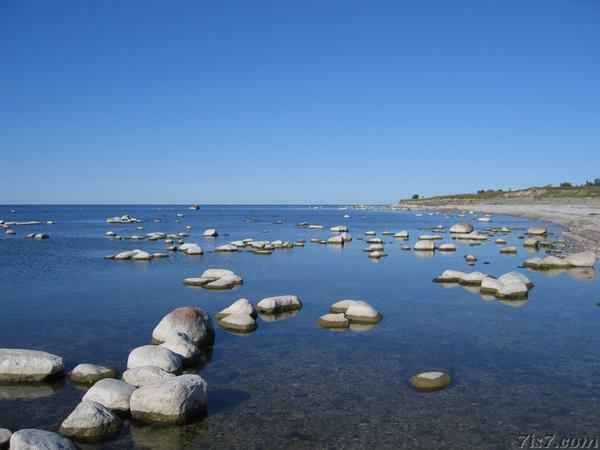 Along the Estonian shoreline one can usually see boulders, as on this photo taken near the Ohessaare cliffs on the Sõrve peninsula on Saaremaa. These boulders have been deposited by glaciers during the ice age, when the glaciers melted they left boulders of varying sizes behind. These boulders were carried here by the glaciers from the mountains in present day Finland and Norway. Boulders along the Ohessaare shoreline. Location: 57°59'35"N 22°0'59"E on: Google Maps, OpenStreetMap, Maa Amet.